Braziers burning proudly below the America Flag during the 2013 Salute to Veterans lighting. Photo by Jessica Ho. 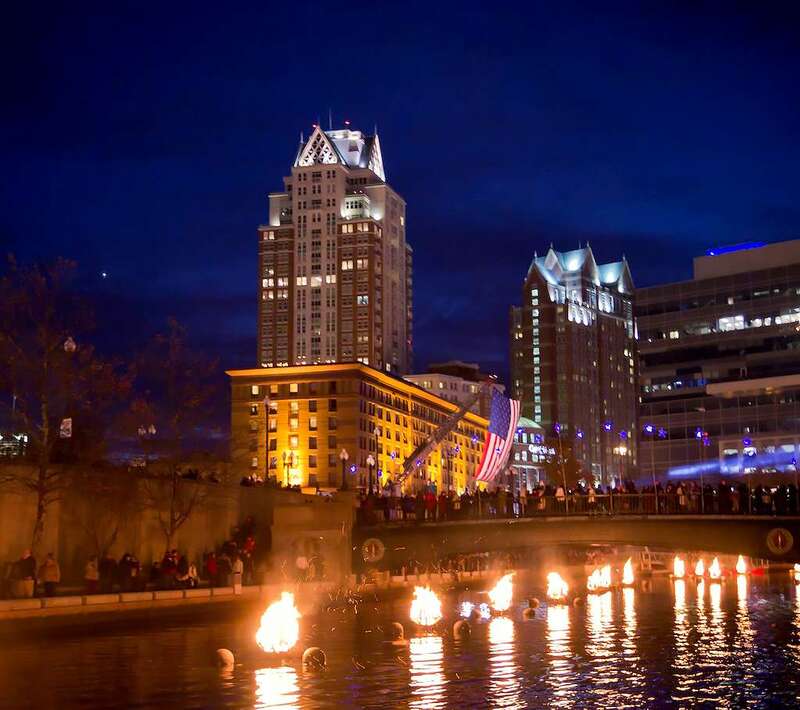 By sponsoring a brazier at the WaterFire Salute to Veterans on November 10, 2018, you’re directly supporting the event and honoring the veteran in your life. The $250 Brazier Sponsorship includes a personal dedication in this year’s printed event program plus a full screen acknowledgment on our digital signage at the event with a photo of your loved one, their name, service information and a personal dedication of your choosing. After the event, we will mail you a brazier dedication certificate in honor of your loved one along with a matted photo print from the 2018 WaterFire Salute to Veterans signed by WaterFire creator and executive artistic director Barnaby Evans. The $100 Brazier Sponsorship includes your dedication in this year’s printed event program with their name, service information with a personal quote. Your dedication will be featured at the event on digital signage throughout the installation. After the event, we will send you a brazier dedication certificate in honor of your loved one in the mail. Sponsorships in before November 1st, 2018 will appear in the printed 2018 Salute to Veterans Program. All dedications will be listed on our website as well our digital program at the event. Make your dedication below. Any questions email Anja Josuweit. Your sponsorship is a wonderful way to honor and recognize those who have served. It also helps ensure that WaterFire Providence is able to continue this tradition of saluting our veterans so that Rhode Island will always have this community event burning brightly for our servicemen and women! See the 2018 WaterFire Salute to Veterans Brazier Dedications.